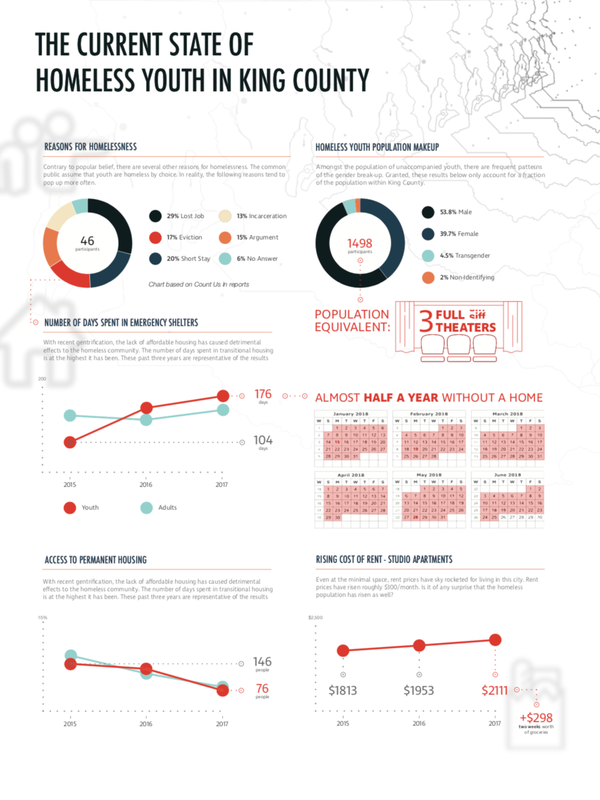 A (multi-platform) infographic to educate audiences about Homeless Youth in Seattle. This project was created in response to the growing population of homeless communities. This motion graphic utilizes vital information about the Homeless Youth population, and educates the audience.The goal of this project was to gain perspective of the Infographic process, and raise awareness of the topic. "Create successful infographics in a variety of mediums. " Designers were challenged to create an infographic from start to finish. The topic of this year's challenge was Homelessness in Washington. Within a group of four people, designers executed research, practiced empathy exercises, and interviewed several professionals and members of the homeless community. Students were set into research groups, and asked to accumulate a variety of information they found pertinent to the data that they wished to visualize. After brainstorming several ideas on which audience to cater to, research objectives were set in order to achieve, said goals. For our group, we wished to focus on the homeless youth and focus our energy in researching information that would be found useful to those who are volunteering with this specific demographic. Having stayed at the Orion Center / Youth Care facilities in 2012, I wanted to reach out to Craig Gibson and learn more information about the Homeless Youth of today. The interview was extremely helpful, and allowed Brennan and I to gain perspective on what the volunteers of Youth Care were experiencing. The primary phase in creating these posters, students were asked to think of different mediums in which data visualization could be possible. Throughout this entire process, students were also asked to think of narratives that would cater to their own target audiences. These sketches were then taken into critiques, sent through more iterations, and finally executed into a digital format of their choosing. After creating several rounds of data visualization, students were told to continue sketching different ways to align the data within a 18" x 24" poster formatting. These restrictions allowed students to challenge themselves in information hierarchy. 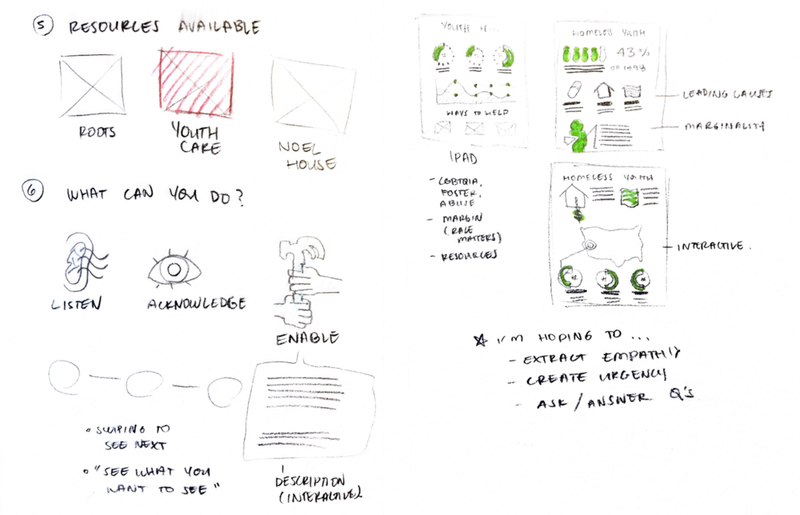 Below are examples of the sketches that I have executed prior to designing a digital file. Prior to creating our final posters, students were challenged to continue their ideations onto a bigger field. This was a very exciting challenge as we were told to incorporate a narrative that would be accessible to those who are of the general public. The critiques received were that my poster had inconsistent visual language, and could be organized and translated into a more user-friendly design / orientation. I took these critiques and continued to work on the poster. Poster design proved to be one of the biggest challenges I've had to face this year. I'm still attempting to reconfigure the content, and am happy to move forward with the useful feedback I had received. I hope to continue and update this page with further iterations of my poster, in hopes that I will be able to get one step closer to creating concise infographics. The initial goal, going into the motion graphic, was to convey empathy. I found this process to be both enlightening and challenging as well. Overall, this step forced me to step out of my bounds of comfort and move forward with creating motion graphics in an efficient way. After finalizing the posters, students were encouraged to create motion graphics to bring the data to life. As mentioned previously, YouthCare has a great significance to who I am as a person. I wanted to take the data that I found particularly relevant, and animated that data into the video below.